Hey there, how’s your week going? I have had cake on the brain and am on the hunt for the most perfect classic celebration cake. With this blog being called “Sifted” I feel like its ok to focus mainly on cakes for a couple posts, right? 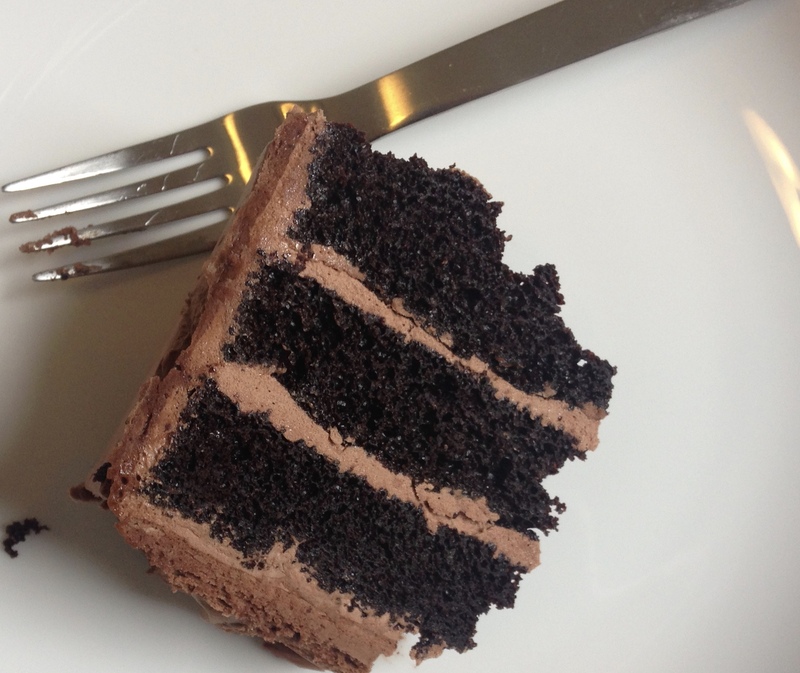 Cake to me is the dessert that beats all desserts. A layer cake is what we call for whenever there is a big event to celebrate. A Birthday, wedding, graduation, or a new baby and a thick slice of cake will announce to the world that this day is special. But alas, my perfect cake alludes me. I have been working on making Italian Meringue Buttercream. This is the type of buttercream that many pastry chefs make. It is a bit like making candy, you heat sugar and water to a soft ball stage and pour it into perfectly whipped egg whites to create a sweet and silky meringue. Then the meringue is added to butter and whipped. With so many moving parts, its hard to identify exactly what I have done wrong. So far, my buttercream is more like sweetened whipped butter and not pillowy light melt in your mouth buttercream. So yesterday, I decided to head to a local bakery and order their biggest piece of chocolate cake topped with Chocolate Italian Buttercream. It was absolutely divine! I’ve posted a picture (of part!) of the cake for you to drool over. I talked to the pastry chef and she said to try whipping the buttercream longer and see if that helps. I felt so encouraged afterward to keep at it and give it another try. I’ll keep you posted! Hope you all have a great weekend and let me know what you’ve been working on. It’s fun to hear about everyone’s projects, baking or otherwise. In high school, my favorite class was home economics, well that or the pottery portion of art class. Both were messy and the end results were a bit questionable – but I enjoyed it all the same. I was particularly fascinated by the baking portion of home ec. Follow a recipe to a T and end up with a cake as fancy sounding as chiffon. We were shown how to properly measure flour (scoop and level) so as not to have a tablespoon extra. I am one of those people who enjoys rules. I enjoy knowing that if I do A, B, and C that I will end up with perfect results (with practice of course). This mindset works well with baking, but not so much with life right? There really aren’t any rules. I thought I wanted to work and be in a structured environment, but I surprised myself and realized that no, I actually need freedom and flexibility. I have passions and interests that I want to pursue and to be able to do that I have to give myself time and space. I’ve spent so much time over the years being pulled along by convenience and ease, but not passion. So this time I quit. I want to spend my days doing what I love. So lets go with that shall we? Lets see where it goes, what winding path is ahead. I don’t have to have it all planned out but can take it one day at a time. Each year, when the weather turns crisp and cool and the leaves start changing color, I get a little giddy. I love the change of seasons. Apples, pumpkins, rosy cheeks, and caramel. This being the first week of fall, I thought this recipe sounded like the perfect treat to eat while sipping my afternoon tea. After his first bite, my 5 year old asked “when are you making this again?” My guess would be very soon. This cake comes from the author of the notorious “Cake Bible”. 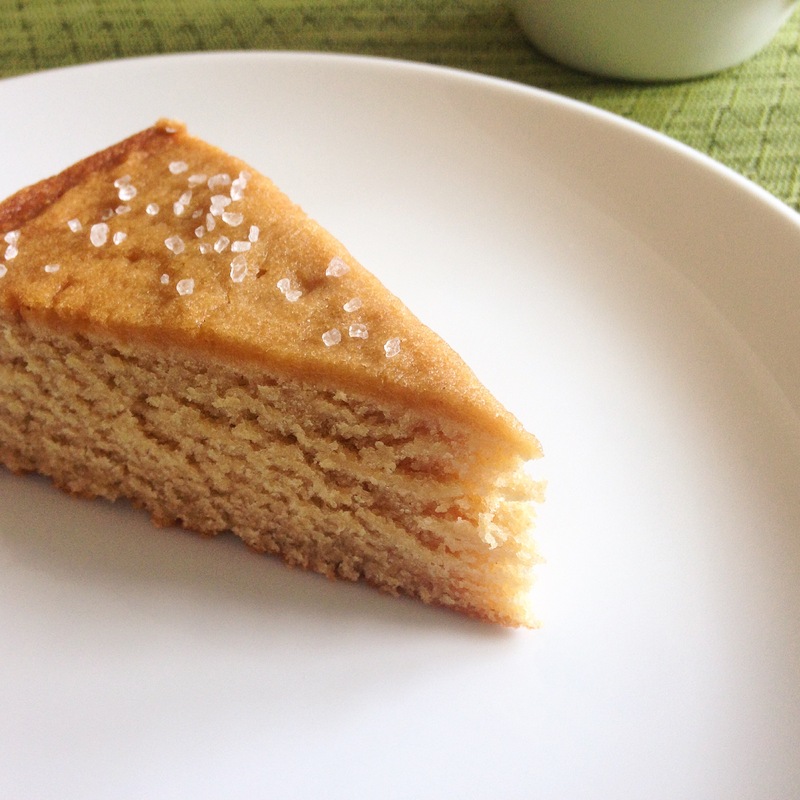 This recipe is out of “Heavenly Cakes” by Rose Levy Beranbaum. Rose suggests using a warmed knife to cut the cake since it has a slightly sticky top from all that wonderful caramel and I would totally agree. Preheat oven to 350 degrees Fahrenheit and place the rack in the lower 1/3 of the oven. Butter the bottom of a 9×2 inch round cake pan. Cover with a round of parchment and then spray with baking spray and then flour. Tap the pan to cover the parchment with the flour and then discard the extra flour that is not needed in the pan. To make the caramel: In a small pan, mix the brown sugar, 3/4 cup milk, and butter on the stove top over medium heat, stirring constantly. Bring to a boil and stop stirring. Place an instant read or candy thermometer in the pan and continue to boil until the caramel reaches soft ball stage (238 degrees Fahrenheit). This will take around 10 minutes. Tilt the pan as needed to get an accurate reading. Once the the caramel is done, pour into a medium bowl and then whisk in the rest of the milk. Set aside to cool. If the caramel is too hot then it will melt the butter in the batter, so be patient. I put mine in the fridge to speed the process. For the batter: In a small bowl, gently whisk together the eggs and vanilla and set aside. In the bowl of a stand mixer, using the paddle attachment, combine the flour, baking powder and salt. Once combined, add the softened butter and cooled caramel. Mix on low until combined and then raise the speed to medium and mix for 1-2 minutes. Scrape down the sides of the bowl. Turn the mixer to medium low and add the egg mixture in two additions, mixing well (30 seconds or so) after each addition. Scrape the batter into the prepared pan and bake for 25-30 minutes. The cake will be golden brown on top and a wooden skewer will come out clean. The center of the cake will also spring back with lightly touched. Let cool for 10 minutes and then invert onto a cooling rack that has been sprayed with baking spray. Re-invert so that the cake is right side up and cool completely. Warm a knife under hot water and then dry on a towel and then cut the cake into slices. Sprinkle with course sea salt right before serving if desired. This week has been a bit crazy. Yesterday, I was taking a walk and a crow attacked my hair- twice. I screamed – twice – then put my hood up and got the heck out of there. Then last night, I left the teapot on the burner without any water in it and felt lucky to not start a house fire (though my husband just bought a fire extinguisher for the kitchen, does this say something about my cooking??). And let’s not even talk about our dinner debacles or the washer breaking down. I also applied for the first job in 5 years and quickly received a rejection. Do you ever feel like you have to learn the same lessons over and over again? That is how this week has felt. Can’t rush the chicken, I feel best when I exercise daily, and success is how I define it – not how others define it for me. It may take me awhile to get back into the workforce, but I haven’t been wasting my time. I set out to have a family and to stay home with my sweet boys. In some ways (most?) what I do as wife and mother holds the most lasting value, but it hasn’t been all sunshine and roses. It’s hard to keep that perspective when it feels like laundry and school drop offs. I actually feel selfish wanting a job, something that I say I do. Something that uses the other half of my brain and involves adults. I think this is why I struggle because I feel like I have what I said I wanted and now I want more. So I say thank you to my husband for giving me the opportunity to stay home during these small years and now for encouraging me to go ahead and continue to dream. I also want to stay patient and don’t want to miss the joy of the journey. No one understands this better than other stay at home moms. I am so thankful for these ladies. 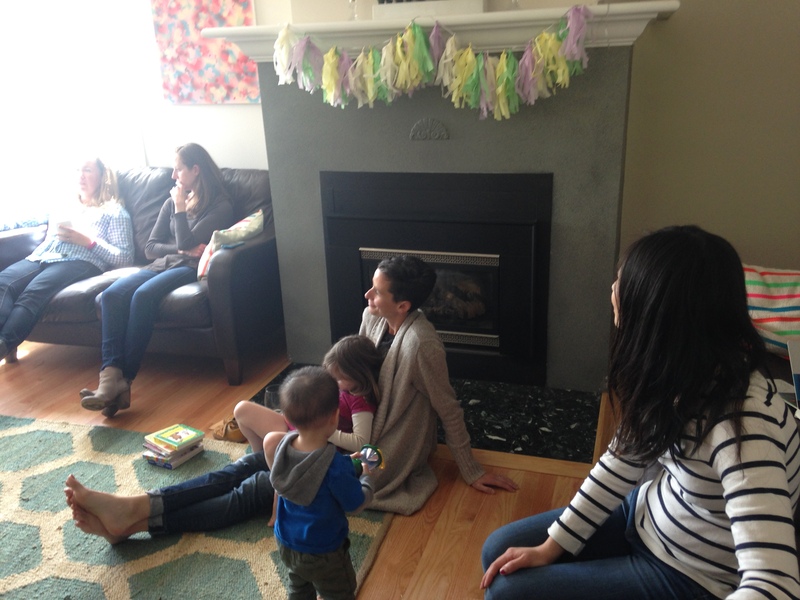 I met most of them at the beginning of our move to Seattle and becoming a stay at home mom. They have been there through teething and speech therapy, through first days and sleepless nights; and they have been such a support through this process of finding a house and making it a home. It seemed fitting to end this crazy week with a celebration. A reminder about all that is good. I stumbled upon this recipe and it sounded so lovely and it got me daydreaming about Paris. 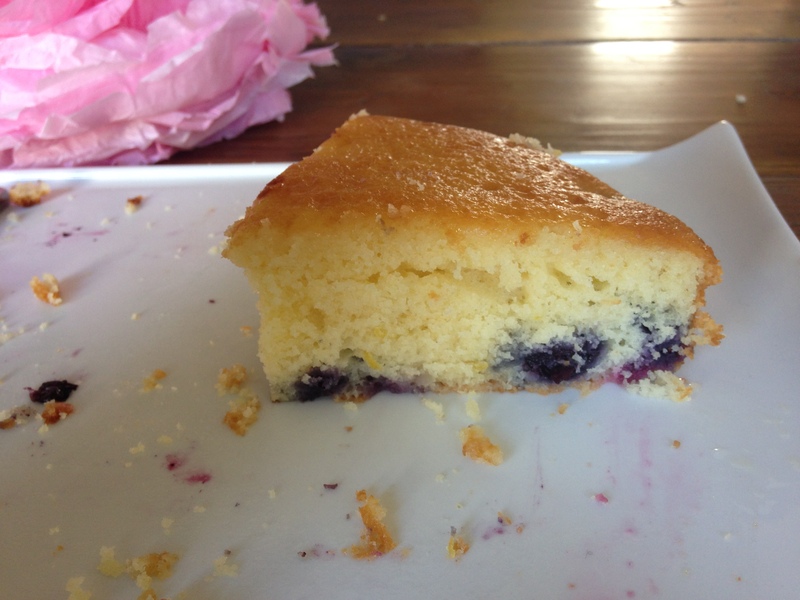 I decided to use this recipe and add frozen blueberries to the middle to make it more of a breakfast cake. I sprung for the full fat plain yogurt to keep the cake texture from being too dry and crumbly. 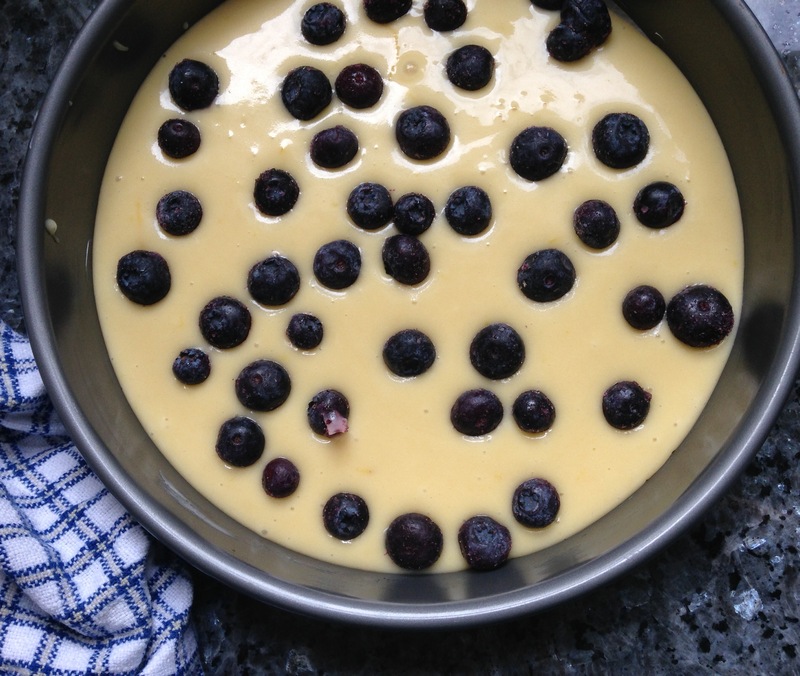 Lemon and blueberry are one of my favorite combinations and I love the simple syrup that is spooned on top. It was a hit! Yields one 9 inch cake. The original recipe comes from Molly Wizenburg’s blog http://www.orangette.com and uses the term “jars” as a measuring unit (so French!) but I am just going to simplify and translate into cups, though I think “jars” is an adorable term. Also, check out this link if you want to learn to zest like a pro. Preheat oven to 350 degrees Fahrenheit. Butter the bottom of a 9 inch round cake pan. Place parchment paper on the bottom of the pan and then butter the parchment paper. Baking is so much more enjoyable when I take the time to prepare all the ingredients first, so go ahead and zest the lemons and measure each ingredient out before starting the next step. It will all come together in a snap! In a large bowl, mix yogurt, sugar, and eggs until well blended. Then whisk in flour, baking powder, and zest and mix until combined into a buttery yellow, smooth, batter. Pour 1/2 of the batter into the prepared pan. Top with frozen blueberries in an even layer (add more if you want!) and top with the rest of the batter, using a spatula to scrape the bowl. Some blueberries floated up but that is ok, I just tucked them back in. Bake for 30-35 minutes until the cake is golden brown and a toothpick inserted into the center of the cake comes out clean. 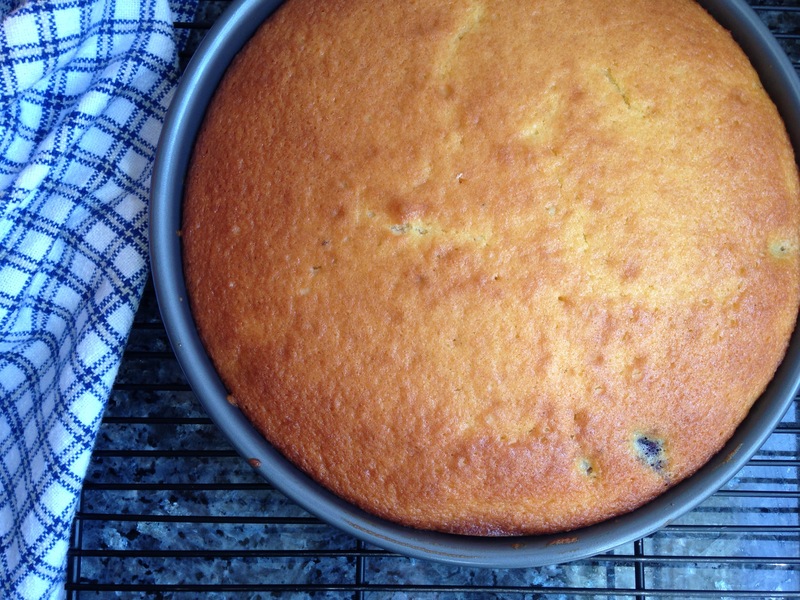 Cool in pan for 20 minutes and then invert the cake pan onto a baking rack to cool completely. Once cooled, wrap in plastic wrap if serving the following day as I did. Once cooled continue on to make the lemon glaze. Combine lemon juice and powdered sugar and whisk until smooth. I placed mine in the microwave for 10 seconds to make sure it was thoroughly combined. Using a large spoon, slowly spoon glaze over top of the cake. The glaze makes for a nice and shiny finish and soaks into the cake.